Pope Saint Damasus I (c. 304 - 384 C.E.) was pope from 366 to 384. Possibly born in present Spain or Portugal in the Western Roman Empire, he was raised in Rome by devout Christian parents. His life coincided with the rise of Constantine I and the reunion and later re-division of the Western and Eastern Roman Empire. As a young man he experienced what is sometimes known as the Constantinian shift associated with the widespread legitimization of Christianity, together with the bitter division of the Arian controversy. Damasus I was raised in the service of the church of the martyr St. Laurence in Rome. Following the death of Pope Liberius, he succeeded to the papacy amidst factional violence. Known for his opulent lifestyle, Damasus faced accusations of both murder and adultery in his years as pope. However, his personal problems were contrasted with his religious accomplishments. He held fast to Nicene orthodoxy during the time the Arianism had triumphed in the east, and did much to promote the primacy of Rome, as well as the acceptability of Christianity among the Roman elites. He also restored numerous churches and monuments to the martyrs, created through Jerome the standard Latin translation of the Bible known as the Vulgate, and presided over the Council of Rome in 382. It was during Damasus' papacy that the Nicene Christian faith became the official religion of the Roman state. Damasus' parents were Antonius, a priest at the Church of San Lorenzo in Rome, and Laurentia. During Damasus' early years, Constantine I rose to rule first the Western Roman Empire, issuing the Edict of Milan (313) which provided religious freedom and other privileges for Christians in all parts of the Roman Empire. Meanwhile the Arian controversy tore the newly empowered Christian church asunder, and a crisis precipitated by Emperor Licinius in favor of paganism resulted in a civil war (324) that placed the victorious Constantine firmly in control of a reunited Empire. This led to the establishment of Christian religious supremacy in Constantinople, now called Nova Roma, bringing new challenges to the authority of the Roman Church. Damasus would have been in his 20s at the time. When Pope Liberius was banished by Emperor Constantius II to Beraea, in 354 for refusing to condemn the orthodox champion Athanasius of Alexandria, Damasus was arch-deacon of the Roman church and followed Liberius into exile, though he immediately returned to Rome. During the period before Liberius' return, Damasus had a great share in the government of the church under Felix II, considered by the Roman Church today to be an anti-pope. Liberius was later reinstated by Constantius, and Damasus stood as a leading candidate to succeed him. In the Roman Catholic Church of that era, new bishops of Rome were elected by the clergy and the people of the diocese in the presence of the other bishops from the surrounding province, which was the manner customarily used in other dioceses. While this method worked well in a small community of Christians unified by persecution, as the newly privileged Roman congregation grew in size and political power, the acclamation of a new bishop was fraught with division. Rival claimants, as well as a certain class hostility between patrician and plebeian candidates, unsettled some episcopal elections. At the same time, fourth century emperors now expected to confirm each new pope. On the death of Liberius on September 24, 366, one faction supported Ursinus who had served as deacon to Liberius, while the other faction—previously loyal to the Felix II—supported Damasus. The upper class generally supported the election of Damasus, while the deacons and laity supported Ursinus. The two rival popes were thus elected simultaneously, in separate locations, in an atmosphere of rioting. This dissension climaxed with a riot which led to a three-day massacre and to the rare imperial intervention to uphold public order. Damasus prevailed, but only with the support of the Roman prefect. Once he was securely consecrated bishop of Rome, his men attacked Ursinus and his remaining supporters who were seeking refuge in the Liberian Basilica, resulting in a massacre of 137 supporters of Ursinus. Damasus was also accused of murder before a later prefect, but his influential friends secured the personal intervention of the emperor to rescue him from this humiliation. The reputations of both Damasus and the Roman church in general suffered greatly due to these two unseemly incidents. Armed guards were now employed to protect the new representative of the Prince of Peace. Only 12 years later, at a synod in 378, was Ursinus condemned and Damasus exonerated and declared the true pope. Despite his controversial election and accusations of immorality, Damasus proved to be a powerful and effective pope who did much to solidify the position of Rome as the center of Catholic orthodoxy. Damasus actively suppressed heresy and promoted the papal primacy. His writings include 24 anathemas (condemnations) against various contemporary heresies. In two Roman synods (368 and 369) he condemned Apollinarianism and Macedonianism. He retained Rome's commitment to the orthodoxy of the Nicene Council even when emperors and prominent eastern bishops supported the Arian cause. Damasus also sent legates to the First Council of Constantinople that was convoked in 381 to address these heresies. Damasus also contributed greatly to the liturgical and aesthetic enrichment of the Roman churches. He promulgated the use of a standardized Latin language format for the mass, and employed a master calligrapher, Dionysius Philocalus, to adorn the shrines of martyrs and Roman bishops with epigrams. These ceremonial embellishments and the emphasis on the Roman legacy of Peter and Paul amounted to declaration to the Roman upper classes that the real glory of Rome was Christian and not pagan. All this, combined with imperial endorsement of the Christian faith, made it more socially acceptable for the upper classes to convert to Christianity. The reign of the Emperor Gratian (359-383), nearly coinciding with Damasus' papacy, forms an important epoch in ecclesiastical history, since during that period, Orthodox Christianity for the first time became dominant throughout the empire. Under the influence of Saint Ambrose, as well as Damasus, Gratian prohibited pagan worship at Rome; refused to wear the insignia of the pagan pontifex maximus as unbefitting a Christian; removed the Altar of Victory from the Senate at Rome despite protests of the pagan members of the Senate; forbade legacies of real property to the Vestal Virgins; and abolished other privileges belonging to them and to male pagan pontiffs. The Eastern Church, in the person of St. Basil of Cæsarea, sought the aid and encouragement of Damasus against Arianism, which had triumphed temporarily in the eastern Roman Empire. However, despite agreeing on the Arian issue, the two could not come to cooperate, due to their disagreement over the Meletian Schism at Antioch. Patriarch Peter II of Alexandria was obliged for a while to seek refuge to Rome from the persecuting Arians. He was received by Damasus, who sympathized with him and gave him support. This helped reconcile the relations between the church of Rome and the church of Antioch, who supported the persecuted Church of Alexandria. Damasus lived to welcome the famous edict of Theodosius I, "De fide Catholica" (February, 380), which proclaimed the official religion of the Roman State to be the doctrine which St. Peter had preached to the Romans, of which Damasus was recognized as the supreme head (Cod. Theod., XVI, 1, 2). In 382, concerned with the growing influence of Constantinople, Damasus called a synod which officially declared Rome's primacy. Damasus made a particularly significant choice when he appointed the church historian Jerome to be his confidential secretary. 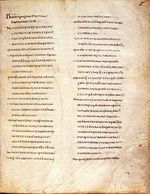 Damasus encouraged the highly respected scholar to revise the available Old Latin versions of the Bible into a more accurate Latin on the basis of the Greek New Testament and the Septuagint translation of the Hebrew Bible, in order to put an end to the marked divergences in the western texts of that period. This resulted in the Vulgate version of the biblical text, which has been highly influential in the history of western Christianity. However, many in both pagan and Christian society saw in Damasus a man whose worldly ambitions outweighed his pastoral concerns. His entertainments were infamous for their lavishness. 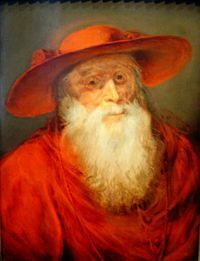 Praetextatus, a wealthy aristocrat and a high priest in the cults of numerous gods, reportedly joked to Damasus, "Make me bishop of Rome and I will become a Christian." Some of his critics called Damasus "the ladies' ear-tickler." An accusation of adultery was laid against him (378) in the imperial court, possibly trumped up and certainly supported by his ecclesiastical enemies. He was exonerated by Emperor Gratian himself, and soon after by a Roman synod of 44 bishops which also excommunicated his accusers." Damasus' legacy was a mixed but significant one. He left a large imprint on the Roman church, maintaining its orthodoxy during the height of the later Arian controversy and greatly promoting Rome's prestige as the "See of Peter," both among the Roman nobility and within the larger Christian world. At the same time, his papacy became infamous for its violent coming to power, its affiliation with the upper classes, and Damasus' own luxurious lifestyle. Damasus was the first pope to refer to Rome as the "apostolic see," and it was he who introduced Latin as the official language of the mass. He helped to discover many martyrs' tombs—as well as Rome's famous catacombs—and did much to support their restoration and veneration. 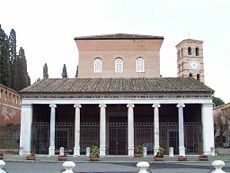 He built and restored many churches, notably the church named for Saint Laurence, known as San Lorenzo fuori le Mura ("St. Lawrence outside the walls"). Although some scholars contend that the above letter is not genuine, it cannot be doubted that Damasus was a great and effective champion of the papacy, whose reign itself was a major factor in establishing the primacy of Rome. This and his sponsorship of the creation of the Vulgate were his most lasting legacies. Coppa, Frank J. 2002. The Great Popes Through History: An Encyclopedia. Westport, CT: Greenwood Press. ISBN 9780313324185. Eno, Robert B. 1990. The Rise of the Papacy. Wilmington, DE: M. Glazier. ISBN 9780894538025. Richards, Jeffrey. 1979. The Popes and the Papacy in the Early Middle Ages, 476-752. London, UK: Routledge & Kegan Paul. ISBN 9780710000989. Shotwell, James Thomson, and Louise Ropes Loomis. 1991. The See of Peter. New York, NY: Columbia University Press. ISBN 9780231096355. Patron Saint Index – www.ewtn.com. Opera Omnia by Migne Patrologia – (Latin). www.documentacatholicaomnia.eu. This page was last modified on 17 November 2017, at 16:42.